Between Reno and Las Vegas lies the little town of Tonopah, Nevada, which exploded into fame on May 19, 1900 at Tonopah Springs. The story goes that a prospector by the name of Jim Butler discovered one morning that his burro had gone walkabout in the night. When he located his missing animal and picked up a rock to throw at him, he realized that the rock he was holding was heavier than you would think a rock ought to be. Butler was convinced he was on to something, but upon visiting a nearby assayer he was told the rock was primarily iron, and pretty much worthless. Traveling back to his ranch he picked up a few more samples at Tonopah Springs, and simply displayed them in his window. Although he didn’t know it yet, he had unwittingly come upon one of Nevada’s richest silver lodes, and Tonopah would subsequently be nicknamed Queen of the Silver Camps. A short while later a man by the name of Tasker Oddie, who would become Nevada’s governor later in his life, noticed the samples of ore in the windowsill. He agreed with Butler’s initial assessment and offered to stand the cost of having the samples assayed again. Butler told Oddie that if he was willing to pay for the assay, he could have a 25% interest. Oddie then secured a second assay of the ore from William Gayhart, offering him 25% of Oddie’s 25% share. When Oddie was informed that the ore was valued at approximately $600 per ton, he sent word quickly back to Butler. Oddly enough, Butler did not immediately file any claims on the site. A look at the hills around historic Tonopah shows the extent of the old digging all throughout the area. Miners feverishly prospected to located the rich veins of silver ore that were abundant in the area. That kind of news never stays quiet for long, and the area began to fill up with other hopeful miners. Mr. and Mrs. Butler filed eight separate claims in August of 1900, and in fact Mrs. Butler is given credit for lighting a fire under her husband and actually staking the claims herself. Out of these eight claims, six of them – Mizpah, Silver Top, Valley View, Burro, Desert Queen and Buckboard – were some of the most profitable mines ever worked in the state of Nevada. Butler made the decision to lease his claims out from December of 1900 until December of 1901. By this time Oddie and Butler had formed a partnership, which received 25% of the profits on any silver and gold that came from Butler’s claims. Although the town was initially called Butler, it was renamed Tonopah in 1905, and was named the county seat of Nye County. Within a year mines in the area had produced silver and gold worth $750,000, and Butler decided to sell his claims which were combined to form the Tonopah Mining Company. By 1921, ore recovered added up to a worth of somewhere near $150 million. The mines needed coal to power the operations in the mines and also the stamp mills. Railroad lines were established in order to transport the coal, including the Tonopah and Goldfield Railroad, the Las Vegas and Tonopah Railroad, and the Tonopah and Tidewater Railroad. Eventually rail transport was replaced by 18-wheel trucks, and at the present time there is no rail service to Tonopah. By 1906 the initial boom was past, but the area continued to produce a considerable amount of ore until the Great Depression. 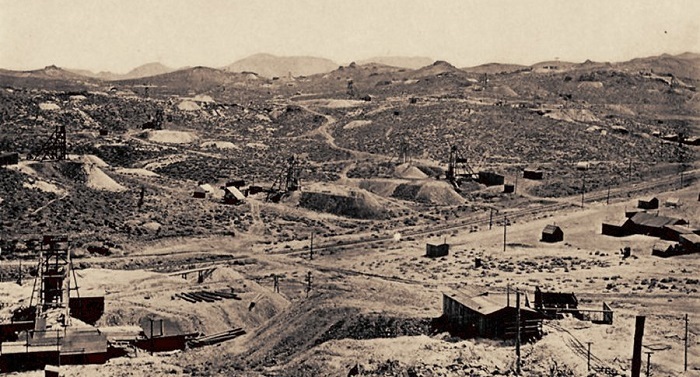 In 1913, the mines of Tonopah produced nearly $10 million in silver, copper, gold and lead. By the end of World War II, all the mines were closed. So many boom towns died on the vine as mineral production decreased, but this was not the case for Tonopah. Even though the population declined at the end of the boom, it became a town with staying power, with law and order firmly in place, and citizens generally did not fear for their safety after dark. The town boasted restaurants, schools, hotels, saloons, a post office, and of course the ever popular red light district. Interestingly enough, whenever disaster struck a miner’s family and help was needed for his family, it was the ladies of the night rather than the upstanding women of the town who showed the most financial generosity toward the destitute. During it’s heyday, Tonopah boasted over 50,000 residents. Today Tonopah is a alive and well with a population of approximately 2,500 people. There is a local military test range thirty miles to the southeast of the town, and most of the population are employed there. There has been talk of moving the test range, and that would impact the economy of the town. Tonopah would not be considered a ghost town, but there are still some original buildings left that legend considers to be haunted. The Mizpah Hotel boasts the presence of The Lady In Red, a prostitute whose perfume is said to linger in the hallways of the hotel. Possibly the creepiest place in Tonopah, in this writer’s opinion, is the Clown Motel. The entire motel is clown themed, it has a display case filled with 500 clowns in the lobby, and clowns in every room. If you like clowns this is the place for you. If you don’t, give this place a miss, because frankly, this writer considers 500 clowns to be more frightening than ghosts. Some upstairs rooms at the Clown Motel overlook the old miners’ cemetery, which is said to be haunted, and even if it’s not, it is a very interesting place. It was only in use from 1901-1911, and some of the miners buried there were killed in a 1911 fire in one of the mines. The cemetery also contains the graves of residents that died of the “Tonopah Plague” in 1902. The consensus of medical experts is that the plague was in fact pneumonia. Tonopah is famous for its lack of light pollution and the clarity of its air. In fact it was rated by USA Today as the #1 place in the country for star gazing. Visit on a moonless night and you can expect to see over 7,000 stars in the sky, as opposed to 25-50 in a brightly lit city. The Tonopah Historic Mining Park offers visitors an opportunity to stroll down the Burro Tunnel, at the end of which they can peer down a 500 foot stope from a steel cage. Back in the Visitors Center old mining equipment is on display, as well as a colorful black light display of minerals, and a theater offering informational videos. New exhibits are constantly being added, and restoration continues, although it is costly. In 2015 the Mizpah Shaft was opened for inspection, and repairs were made. The Silver Top head frame and the Desert Queen head frame are falling apart, and the Tonopah Historic Mining Park Foundation hopes to raise funds to restore these and other structures.